Reach for the sky! Or for a six-shooter or a rifle, a shotgun, cast-iron skillet, heck even a hunk of wood! It’s High Noon Saloon! The High Noon Saloon card game recreates an old west saloon brawl with all the subtlety of…well…an old west saloon brawl! Players take on the roles of different western characters arm themselves with whatever weapons they can find from a Red-Hot Poker to a Peacemaker. Each player attacks the other players one-on-one then scrambles for cover as the bullets, chairs and tomahawks start flying! Last person standing wins (and foots the bill for the damage!) Grab yer gun varmint, you’re gonna need it! The game has two main play areas: the player mat and the saloon game board. Each player grabs a player mat and chooses one of 8 unique characters included in the game. The player mat has a place for the Character card as well as three other crucial areas: The Fist: stores cards that you want to hold in your hand to use for attacks, the Holster: where you place a handgun for future use, and an area for players to track their “Grit.” Once yer Grit is gone, yer done for. The saloon game board is divided into seven distinct areas called “Cover” where the characters “hunker down.” Some provide a defensive bonus; others provide a bonus to attack. Players grab a token that matches their character card and place it in one of the areas of the board to start. The Saloon deck contains all the cards that players will use to fight it out. There are four different cards in the Saloon deck: Attack Enhancement cards (which provide a bonus to attacks), Block cards (which provide a bonus to defense), Reload cards, (which allow a player to add bullets to their guns), and Weapons… all sorts. The Saloon deck is shuffled and players receive a hand of 7 cards. Then the Load Deck, which provides ammo for the guns, is also shuffled and placed face down. Each player gets a “Set up Round” where they may place a weapon in their Fist and or in their holster and load their weapons. Ready… Set… Duck! Each player’s turn has 6 phases. It sounds a bit complicated, but don’t worry, things move fast. Scavengin’ Phase: Players discard any or all cards in their hands and draw back up to 7. Oh look a fully loaded shotgun! Who left that there? Weapon Phase #1: Players reload their Weapons, and play Weapons cards to their Play mat. Weapons can also be switched from Holster to Fist and dropped. Jump Phase: If a Player feels so inclined, they can jump out from cover into the middle of the saloon. This is called “No Cover”… Yipe! Fightin’ Phase: Yup, you guessed it: Blam Blam Blam, Thwack, Bonk, Ugh! Players use weapons to attack other players. Hunkerin’ Down Phase: Get the heck outta there! Players can move their characters to new Cover. Weapon Phase #2: Out of ammo? Once gain you can drop the weapon in your hand, draw from your holster and play new weapons onto your play mat. The Fightin’ Phase requires a bit of a more detailed explanation. Players announce whom they are going to attack and say what weapon they are using. (it has to be in their Fist). The attack can be a Melee Attack, which only allows a player to attack a player within Reach, or it can be a Gun Attack, where you can shoot at anyone anywhere in the saloon. The chosen Weapon (or bare fist) provides a base attack in the form of a number. The attacking player may then play any number of Attack Enhancement cards from their hand. This adds to the total attack value. Follow me so far? The player who is being attacked gets a chance to play one (and only one) Block card. This subtracts from the attack value. The difference is subtracted from the target players Grit. Outta Grit? Yer pushin’ up daisies. The End. That’s it. But wait! High Noon Saloonoffers something new: Team Play. Let’s take a gander. There are several ways teams can face off: two teams of two, three teams of two, or three three-player teams. 18 additional Team cards are added to the Saloon deck and essentially increase the interaction between the teammates and provide great cooperative, combative options. Toss me that Six Shooter! Only one player tracks the Grit for their entire team. So, when any player from a team takes damage it is subtracted from the team total. Also, when attacking an opposing team’s character, the teammate can add one Attack Enhancement card to the attack. Lastly, one special end-of-turn action is added to team play: a player may pass one card to their teammate who has to accept the card. Once a team’s total Grit is reduced to zero… call the undertaker! Being a card game with unique text entries and effects on the cards, there will be a bit of reading the first time out, but once played, the game is easy as rhubarb pie. Despite a very friendly graphic treatment and quick and humorous game play, families with younger children might choose something else. The game also presents a unique family opportunity where you least expect it. (See “Final Thoughts”). As rough and as rowdy as this game is, it’s a grit yer teeth, tactical card game. For Social gamers, the game can be very…unsocial. High Noon Saloon is basically a card game: shuffle draw and play. There is a bit of strategy in the movement options and timing of card play, but players are not in complete control of their options. Maybe a fun filler. A Casual Gamer’s dream! Simple set up, game play and tons of player interaction. Plays in 30 minutes and promotes funny western accents. Yeee hawww! Although the game has high replay value with variable player powers and unexpected card combo victories, dominant strategies do begin to appear in time using the character abilities. Avid gamers may not find it a long-term go-to game. Shuffle, play, draw, shoot, duck, reload, shoot and die. There is nothing very deep here and that’s the point. Not much depth for the Power Gamer. Move along little dogie. From a design standpoint, the standard game of High Noon Saloon plays great. It’s fast, well constructed and the unique card effects and character abilities provide a wide range of game experiences and outcomes. Yes, some characters are a bit better than others (ahem… Lisa Barstock ) but a player still must draw, manage and utilize their cards well or get mercilessly pummeled. Ok – so what? There are a lot of great card games that have good mechanics. All right, the next reason is High Noon Saloon is fun! The creative mix of card art and great western jargon card titles give you a giggle even after many plays. The titles of the Attack Enhancements, when spoken along with your attack card create some memorable western style trash talk! In fact, the card titles slowly force you to begin talking like you are in an old spaghetti western. You can’t help yourself. The theme and experience are so immersive; players will walk away enjoying the game much more then they think they would. Still not enough? One final, indisputable reason: team play. The game shines with its one-on-one play, but High Noon Saloon offers a team play experience that raises it above all other similar games. For some reason, the team play rules are almost an afterthought – two additional pages of rules in the back of the instruction book – but it should be the first way to experience the game. The theme and level of interaction that the team play variant offers is worth the price of the game. A word of caution about the recommended age for the game: Cliff Bohm and Geoff Bottone have designed the game perfectly to soften some of the violent aspects: (“Grit” instead of “Health” etc.) there is no blood, no graphic images. But the game is about one thing: shooting other folks. It may be a little too topical for some families. High Noon Saloon is a great game to play with your significant other. That may be enough to push those other western games right off the shelf. On a windin’ desert road in the middle of nowhere lies a town with no name. In this town you’ll find a place where no slight goes unanswered and no fight stays private… the roughest, toughest waterin’ hole in the Old West… The High Noon Saloon. If you’re lookin’ for a fight, you’ve come to the right place. 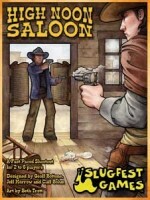 High Noon Saloon is an action-packed game for 2-6 players. You are a combatant in an all-out brawl fought in an Old West Saloon. Shoot it out from a distance or get in close and beat on your opponents directly. Move between different parts of the saloon to get the upper hand. Whatever you do, make sure to keep your guard up… if you’re not careful, you’ll get beaten to a bloody pulp, shot full of holes, or both! The last one standin’ wins, and there ain’t no prize for second. High Noon Saloon also includes special rules and cards for playing games in teams. It’s game is something my game group and I reach for when we need something fast and really fun. It takes very little time to learn and very little time to play. We haven’t gotten tired of it yet. There is something fn about a western shoot out game with only cards, and a few tokens. Add a Review for "High Noon Saloon"